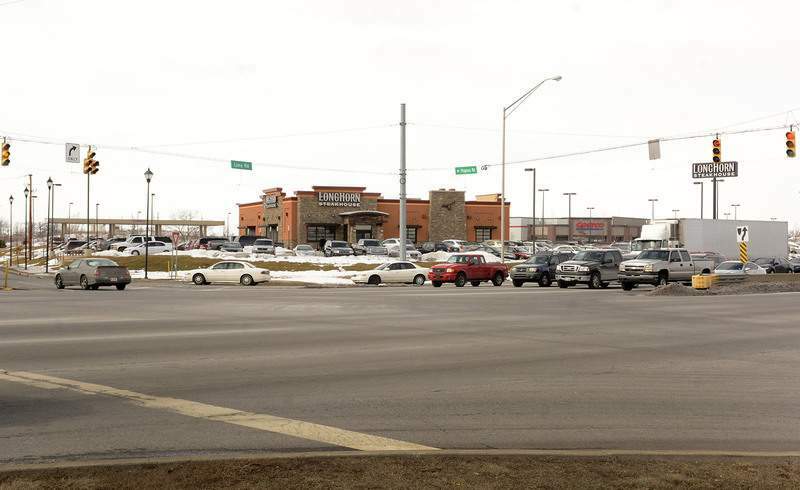 Samuel Hoffman | The Journal Gazette The development near Interstate 69 and Lima Road, which features a LongHorn Steakhouse, Costco, and Kelley Chevrolet, is an example of a successful TIF district. For years, the site of the former Seyfert potato chip plant sat vacant, with only the faintest hint of development from pilings for a hotel project that had started construction in the 1980s but lost funding. Stormwater problems caused flooding and other issues at that location and the Interstate Business Park next door. But now the site is home to a Costco, Kelley Chevrolet and a LongHorn Steakhouse. The development would not have been possible without the use of a tax-increment financing district, said Justin Brugger, Fort Wayne’s redevelopment director. TIF districts are a form of economic development incentive, used to entice businesses to move to an area. Property tax revenues generated within a TIF district can be captured and used for improvements within that district. In Indiana, TIF districts can be formed by a county or municipal government through a redevelopment commission. There are 20 such districts in Allen County, including Fort Wayne. While city and county officials across Indiana often refer to TIF districts as necessary economic development tools, one study from Ball State University’s Center for Business and Economic Research says otherwise. Some examples of projects fueled by Fort Wayne’s TIF districts include BAE Systems at 2000 Taylor St., Centennial Industrial Park at 3619 Centennial Drive, and the Summit industrial parks in northwest Fort Wayne. The ongoing Ash Skyline Plaza and planned Cityscape Flats development are also examples of TIF projects. The Jefferson Pointe TIF district was extended downtown in 2007 to cover Harrison Square. A Ball State study evaluated Indiana TIF districts from 2003 to 2012, and it found that statewide, property owners who don’t reside within a TIF district may pay slightly higher property taxes to make up for taxes captured by the district. TIFs may have a negative effect on employment and business in a county, and the size of a TIF district could also slightly increase the net amount of property tax revenue a municipality or county collects. However, the study points out only the possibility of the effect TIF districts may have on tax rates, property and sales tax revenues, and businesses; there isn’t enough evidence to make conclusions. Regardless, the study recommends that the General Assembly review TIFs, and it recommends limits and changes to who can use them. Michael Hicks, co-author of the study and director of Ball State’s Center for Business and Economic research, said Fort Wayne is one example of a city that has "great examples of the use of TIFs." "If I were to pick four places statewide where I could say there have been good use of TIFs, I would say Indianapolis, Fort Wayne, the Toyota plant in Princeton and the Honda plant in Greensburg," Hicks said, citing Parkview Field and ongoing downtown improvement projects as examples. Fort Wayne and Allen County officials disagree with the general notion that TIF districts may not be effective economic development tools. Brugger, the city’s redevelopment director, said the report is general in nature and doesn’t provide enough of a distinction between rural and urban TIF districts. "I would note that urban and rural TIF districts are markedly different," Brugger said. "TIF has traditionally been a redevelopment tool to redevelop urban areas, and has been very successful for that. But using TIF in a rural area to develop an agricultural area has a very different effect. There are different financial models and structures when you do that." In urban areas, Brugger said, there is typically existing infrastructure, roads and a population in place to support the TIF district. In a rural setting, those support mechanisms may not be in place. "If we didn’t have a TIF district where Franklin Electric is right now, we wouldn’t have Franklin Electric," Allen County Commissioner Nelson Peters said of the company’s location at 9255 Coverdale Road. Peters said the option to create a TIF district helps Allen County be competitive in a time when states, counties, and cities are competing for economic development. "If we don’t exercise our options for TIF or tax phase-ins, then Michigan will, Ohio will," he said. "We were competing with other states for that Franklin Electric project, and had we not been able to do some of the stuff that we did, we very well could have lost them to another state." John Urbahns, executive vice president of economic development at Greater Fort Wayne Inc., said when looking at the differences between rural and urban TIF districts, it’s important to note the percentage of a county’s tax base that falls within a TIF district. According to data from the Allen County auditor’s office, TIF districts represent about 3.5 percent of the county’s net assessed value. That’s close to the average for Indiana counties. The study reported that on average, 3 percent of a county’s assessed value falls within within a TIF district. Some counties had none, and one county reported that 22Ã¢ Â¯percent of its assessed value lies within a TIF district. The study does not identify figures for specific counties. "That’s why I think broad generalization is hard when you’re looking at a county that has 4 percent of an assessed value in a TIF district, as opposed to a county that has a much higher percentage in," Urbahns said. The more important things to look at, Urbahns said, are the results of individual TIF districts, and what projects TIF districts have helped secure for a municipality or a county. The General Motors plant in Allen County is an example of a company that would probably have not come to the area had TIF not been an option. "You need to look at them based on individual TIFs – were they valuable or not – when you look at the result of that TIF district, and they’re all a little bit different," he said. "But I would say if you look at all of them here in Allen County, there’s direct results and direct economic results that have come from those TIF districts." Brugger said the city’s use of TIF districts for development is done conservatively. "Our use of TIF is targeted, it’s transparent, and it’s temporary," he said. "We target specific areas for economic development, for redevelopment, all of our materials are on our website, our videos are on our website, and when we no longer need the TIF to support the infrastructure, the brunt of the project, then we do turn the TIF district off." The length of time a TIF district is active depends on the type of development, the location and what additional development might come to that area of the city. "It’s certainly something downtown continues to see – more development and more growth – where something in any less concentrated area might be more temporary," Brugger said. The big problem lies in how TIF money is spent, Hicks said. "If (the funds) are used to do things the government ought to do anyway, like water or sewer improvements, that are necessary because of the new business or because they’re trying to improve the quality of life, then it would be very difficult to criticize a TIF right away on that. Those are appropriate uses for a TIF," he said. "But if the funds are used to subsidize a local government so they don’t have to make budgetary cuts that are ultimately necessary anyway, those aren’t appropriate uses for a TIF." Hicks said an example of a questionable use of TIF funding would be one city’s use of TIF dollars in 2009 to buy a new fire engine. While Fort Wayne and Allen County may be using TIF districts in a responsible manner, there are counties that may not, Hicks said. "There are clearly some TIFs in the state that are disappointing, they’re not achieving the goals they set out to do," he said. "We’re supporters of TIF," Hicks said, noting that the study in no way recommends eliminating the districts. "But we think the state is at a position now where we’d have to take a hard look at the good characteristics of TIFs and the characteristics of TIFs that have not yielded a benefit. "So our study is correct, but what we really argued is that we need to look at TIFs more closely."